Providing an observable example of the effect of albedo on temperature is very useful in demonstrating the importance of albedo to students. Not a lot of background materials for educators. When teaching about the decreasing snow cover - Specify the amount of decrease for land ice or glaciers. The number that is given for the decrease of the ice cover is a little out of date. For the annual average, the trend from NSIDC numbers is -4.2% per decade over 1979-2009. Of course for albedo, the key time period is summer when the sun is up. For September, at the end of the summer melt season, the trend for 1979-2009 is -11.9% per decade. 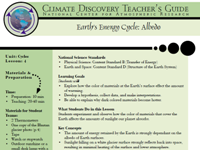 Hands-on activity fosters student understanding of how local, regional, and global albedo effects are critical to predicting global climate change. Has a good section to teach the importance of noting limitations of models. Engaging introduction for students using a photo of Himalayan glaciers for observation and study. Good worksheets included for students. Assessment needs to be improved by educator. User must go to different websites for module background and unit background.